This post is long, but so special to me. This is the story of the journey to our third baby, who just turned one in March. I have shared snippets of our story and our losses with many, but I figured I would share it all. The journey to welcoming our third baby, Eli Parker. In 2014, only one year after welcoming our second baby, we decided we wanted to try for a third. Our first two were only 19 months apart, and although some days I felt insane, we really enjoyed the age gap and were hoping our second and third would be less than 2 years apart. 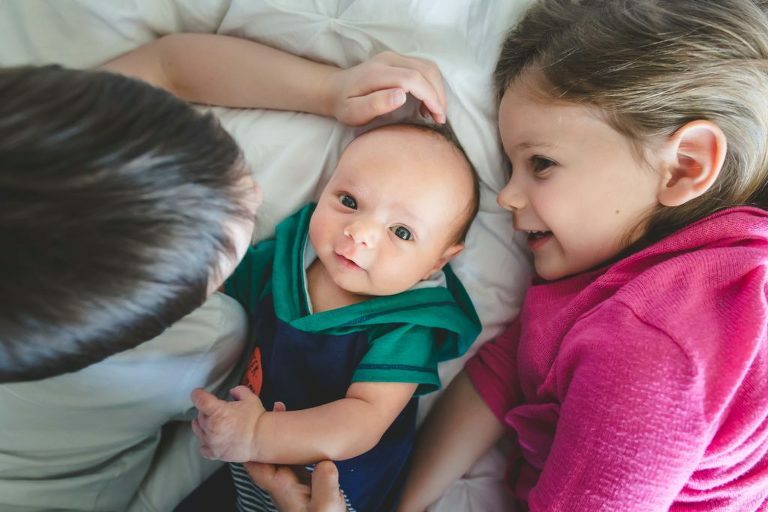 We got pregnant very easily with our first two, so once we decided that we would try for baby number three we assumed it would be a matter of only a couple months before we saw another positive pregnancy test. We had no idea what was in store. Weeks turned into months of no positive test. Each month passed, another negative test came, and more tears fell. After about 3 months of trying I remember being a wreck. Who was I to be so upset over not being pregnant within 3 months, when so many that I knew had been struggling with infertility for years. I just couldn’t believe we weren’t pregnant yet. We continued to try each month for over a year. I tracked my cycle obsessively, we even did three rounds of clomid, all without avail, still no pregnancy. After about 15 months of trying my husband unfortunately left on a 7 month deployment. I couldn’t believe it. Not only was my second child 2 at that point, I was so upset that he was leaving for so long and that our journey to baby number three had to be put on hold for so long. It was a very emotional time. We said our goodbyes and for seven full months I couldn’t see my best friend, my rock, my sweet husband. Luckily with two young kids, a move across country on the horizon, having to rent out a house, find a house to buy, pack up our whole lives, all while running my business the seven months went by relatively quickly. Two weeks after he arrived home, we loaded up our truck and moved across country. Settling into our new home in Colorado we both knew we wanted to continue the journey to try and welcome baby number three. Shockingly within two months I was pregnant. We were ecstatic. I was in true disbelief but was so excited everything we had hoped for was finally happening. Unfortunately, at only 8 weeks into the pregnancy I experienced a miscarriage. It was a missed miscarriage. We went in for our ultrasound expecting to see a healthy baby and heartbeat since I had no signs of an impending miscarriage, but instead learned we lost the baby. Several days later, I passed everything at home. It was the hardest thing I had ever gone through (up until that point) and I was in a very dark place. I went into a depression. A couple months later we decided to start trying again and hoped for the best. Again, shockingly, we were pregnant a couple months later. I remember texting my midwife (before I even told my husband) a picture of the two dark pink lines and was in complete dis-belief. Because of our previous miscarriage she got me in at 6 weeks for an early ultrasound and we saw the most perfect little peanut and the tinest little heartbeat. It was hard to see, but it was there. Our baby was growing right on track. We were still cautiously optimistic, but hopeful because we never got to see the heartbeat with the first loss. After several first trimester ultrasounds, a great first trimester screening, bloodwork that looked great, we were so thrilled to be in the second trimester. I had an at home doppler that I used on the regular starting at only 12 weeks or so. I heard the heartbeat every time. It was so reassuring. At 16.5 weeks I went to listen to the heartbeat like I always had before and couldn’t find it. After several minutes of nothing I really started to panic. This was just before bed, so my husband calmed me down and told me to get some sleep and we can listen to it in the morning. I thought maybe the baby was just “hiding.” The next morning, as soon as I woke up, I listened again. Nothing. The sound of silence was so daunting. I was so overwhelmed and really was so confused. Why couldn’t I hear it? I just heard it two days ago. I called my midwife and asked if she could fit me in that morning for some reassurance that everything was fine. I arrived at her office and we both laughed at how paranoid I was being, as she was sure everything was fine and it was just my doppler wasn’t strong enough to pick it up. After she listened, we still heard nothing. I then really started to panic. She powered up the ultrasound machine and as soon as she put the wand on my belly we saw the sweet baby, but no fetal movement. Confirming there was no heartbeat and no movement. How does this happen? I was almost halfway through my pregnancy. I was devastated. I called my husband sobbing and he knew right away our worst fears were happening yet again. The following night I was induced and several hours later I delivered our sweet baby. We held her and cried so many tears. It was the hardest day of our lives. The following four to five months after that loss I was in the darkest of times. I could hardly get out of bed in the mornings, and was in bed by 7-8pm every night. My world was shattered and I wasn’t the best mom to the two beautiful children I did have. I feel guilty for those days, but at the time its all I could do. I didn’t know how else to handle everything that had been thrown our way. While going through this dark time, I continued to put a smile on my face and photograph some beautiful babies for my clients. As a newborn photographer I had to face my fears and put my personal battles aside. It was bittersweet because I LOVE what I do and LOVE capturing those memories for clients, but as I watched friend after friend, client after client welcome their beautiful healthy babies I was disappointed I wasn’t welcoming mine. In July of 2017 things started to look up. I saw another positive pregnancy test. I tested super early (only 3 weeks pregnant) so the second line was very faint, but it was there. I was terrified, oh how I was terrified. It was hard to get excited when I had just suffered 2 losses in the previous year. Week after week went by. My HCG levels were rising, my sweet baby looked perfect on ulstrasound, my morning sickness was on point (haha). All good signs. I still couldn’t bring myself to get super excited, but as each day passed we became more and more hopeful. At about 15 weeks pregnant I went to the bathroom right before bed and was shocked to see a lot of blood. I burst out in tears and disbelief. I couldn’t believe this was happening again. Was I really experiencing yet another loss. My older kids were already tucked away in bed so I told my husband to stay home with them and I would drive myself to the ER. I showed up expecting the worst, for them to tell me my sweet baby had passed. But to everyones surprise, there he was kicking and moving and looking beyond perfect. A huge sigh of relief, but I knew we weren’t out of the woods. Why was I bleeding? As the weeks went on we started seeing a maternal fetal specialist and was diagnosed with a sub chronic hematoma. Basically a bleed on the lining of the placenta. They told me to limit my activity but with that they were optimistic I would continue to have a healthy pregnancy. The pregnancy did in fact continue on healthy. I was an emotional wreck most days and was so afraid of the worst, but continued to try and hold out hope that this would all end the way it should. At 37w5d pregnant I lost my mucus plug and was so hopeful I would meet my baby soon, and I did. That night at 11:53 after a very quick labor I welcomed our long awaited third baby, Eli Parker. He was perfection.